The Qualla phase of western North Carolina is best understood within the context of the widespread Lamar culture that is found across the northern half of Georgia and Alabama, most of South Carolina, the western half of North Carolina, and eastern Tennessee. The Qualla phase of the Appalachian Summit falls within the Middle and Late Lamar periods and is contemporary with the Tugalo and Estatoe phases of north Georgia. Whereas most Pisgah settlements are in the eastern and central North Carolina mountains, most Qualla sites are concentrated in the western and southern mountains, in the Little Tennessee and Hiwassee drainages. Settlements of both phases are found in the central mountains along the Pigeon, Tuckasegee, and Oconaluftee rivers. Previously, it was thought that Pisgah preceded and lead to the Qualla phase throughout the North Carolina mountains, this view is no longer tenable. Although it has not yet been identified, early Qualla (or Lamar) phase culture was in the western mountains when early Pisgah influences were felt in the central portion of the Appalachian Summit. Qualla clay pipes from Peachtree (top, left) and Cullowhee (top, right) and Qualla stone discoidal and celt from Tuckasegee (bottom row). Like Pisgah phase, Qualla phase has artifacts that reflect an influx of new ideas to the Appalachian Summit, including clay pipes, polished stone discoidals, and stone celts. Although the earliest Qualla materials are probably yet to be discovered, the Middle Qualla begins around A.D. 1450 and ends around A.D. 1700. Late Qualla is the period of the Cherokees' sustained contact with Europeans. 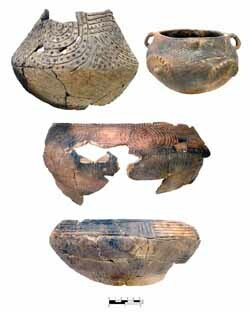 Middle Qualla vessels from the Coweeta Creek site. The bottom two vessels are cazuela bowls with incised designs between the rim and shoulder; the top two vessels are jars with incised, punctated, and applied-clay decorations. Middle Qualla phase vessels are most often stamped with a carved wooden paddle. Rectilinear-stamped and curvilinear-stamped designs are present, with the latter becoming more popular later. Concentric circle, figure nine, parallel undulating line, chevron, and rectilinear line block or herringbone were popular motifs. Cazuela bowl forms appear during the Middle Qualla phase with incised designs around the bowls' shoulders. Incised designs of Middle Qualla appear most similar to the Middle Lamar Tugalo phase of northern Georgia. 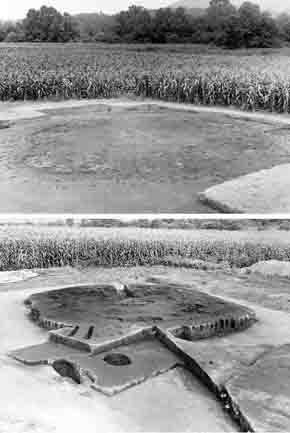 Two views of the Coweeta Creek mound during excavation: view with the plowzone, sand floor and daub fall removed, revealing Structure 1 (top, looking northeast); and Floor 3 of Structure Group 1 (bottom, looking northwest). (Courtesy of the Research Laboratories of Archaeology). 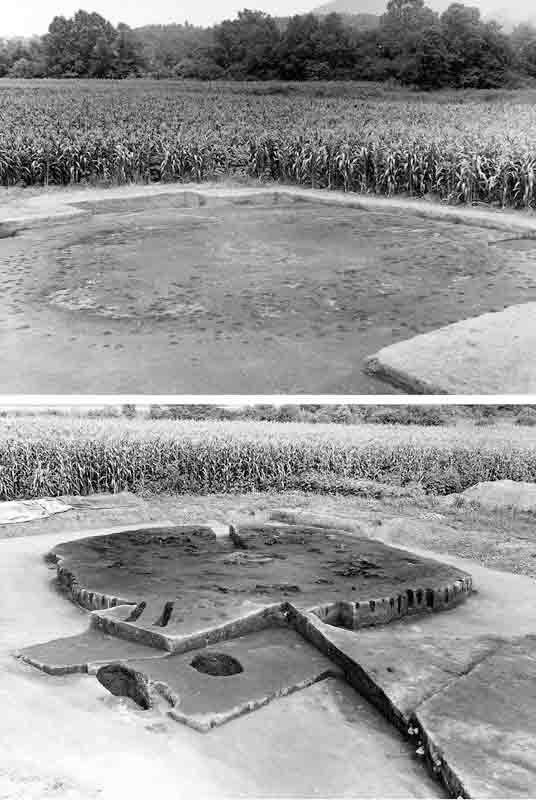 Although some earlier Qualla phase platform mounds were constructed and used as summits upon which chiefs resided, later Qualla mounds resulted from accumulations of the rubble and debris of successive town house structures built on the same location. Additional soil was added only to flatten the ground surface so new town houses could be erected. An artist's conception of the mound and townhouse at Coweeta Creek (drawing by Frank Weir, 1970, courtesy of the Research Laboratories of Archaeology). Excavations at Coweta Creek site on the Little Tennessee River in Macon County, found six separate town house floors stacked one atop the other, separated only by a few inches of sand and refuse. 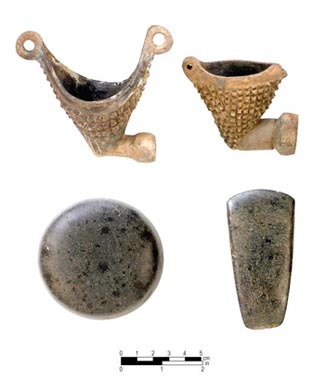 European trade artifacts were found in association with all but the earliest town house floor. Excavation plan of the Coweeta Creek site showing the town house and dwellings surrounding the village plaza (drawing by Chris Rodning, 1998, courtesy of the Research Laboratories of Archaeology). Middle Qualla phase houses excavated at Coweeta Creek were identical in size and shape to Pisgah houses at Warren Wilson site. They were rectangular, a little over 20 feet on a side, and had vestibule entrances and interior supports. 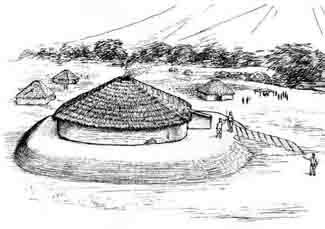 At Coweeta Creek the excavated village predated the later stages of the town house construction. After European contact, Qualla settlements appear to have become more dispersed. However, the continued use of the Coweeta Creek mound and town house during the Historic period indicates a strong sense of community. Most graves were placed in the village area, often associated with houses. But groups of graves were found on either side of the town house entrances. The presence of these burials strongly suggest that these individuals were important members of the community. Both males and females, as well as children, were present. Town house area burials with the most elaborate offerings were males, interpreted as town leaders. Among those burials found throughout the village, women had more elaborate offerings, suggesting that they filled the roles of clan leaders. 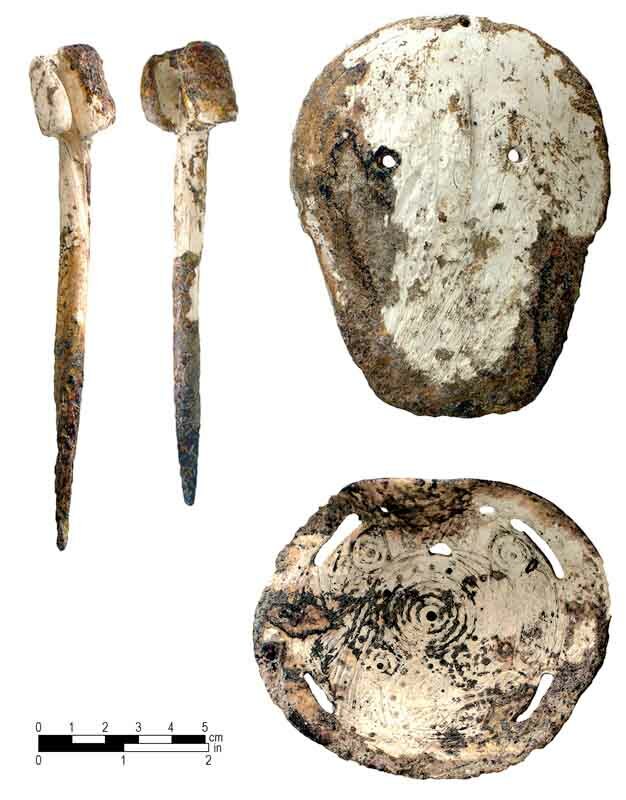 Overall, burials with grave offerings were accompanied with artifacts of shell, including cut shell beads, olivella beads, ear and hair pins, engraved gorgets, pendants, and masks. Other grave offerings were stone and clay pipes, pottery vessels, red ocher, and freshwater pearls. In general, later Qualla and Lamar cultures appear to have become more egalitarian, with authority becoming grounded in community consensus. The town house became the focal point for the community. where decision-making was opened up to a large segment of the population, which was represented by clan leaders. Farming continued to be the most important subsistence activity. Corn, beans, squash, pumkins, and gourds were planted in the fertile alluvial soils, and a wide variety of seasonally available foods and wild animals added to the diet.